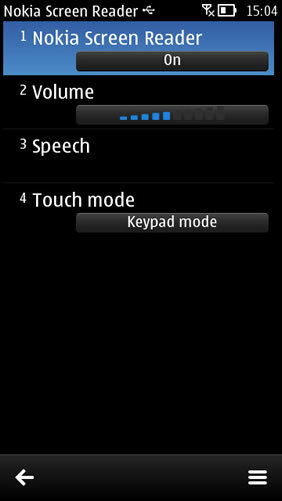 Nokia Screen Reader is a free screen reader that adds voice assistance to Symbian devices. Nokia Screen Reader is a free screen reader available for people with visual disabilities and also for general users who would like additional voice assistance on their smartphone. 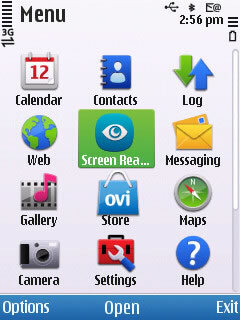 The screen reader is an easy-to-use and simple application designed to meet the accessibility needs of Nokia smartphone users. The application is a simplified version of the powerful Mobile Speak screen reader. It speaks the text content of the currently focused item on the screen, following focus as the user moves around the different applications on the phone. It uses a simple command structure to let users get the important information quickly such as date and time, signal strength, connection status, etc. The phones currently supported by Nokia Screen Reader are: Nokia 500, 603, 700, 701, 808 PureView, 5530, 6120, C5-00, C5 5MP, C6-00, C6-01, C7, E5, E52, E6-00, E63, E66, E7, E71, E72, N79, N8, N85, N86, N96, N97, N97 Mini, X6 and X7.